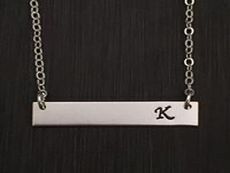 A sterling silver rectangle bar is stamped with your favorite affirmation or name. The ends are stamped with one of our design stamps. The bar is hung between our link chain. Lengths offered are 14",15", 16", and 18" chain. To order this item, please select a style, name or affirmation, design stamp and length of chain.